I always love finding an easy and inexpensive solution to a difficult design challenge. 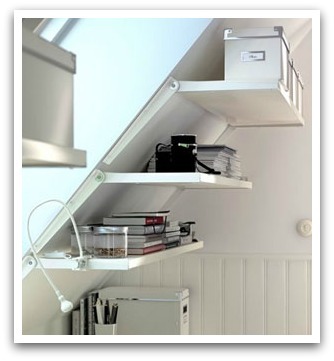 Here’s a simple application for wall-mounted shelving used in unusual spaces where your walls may not be at a right angle to the floor, such as attic spaces or under the stairwell. 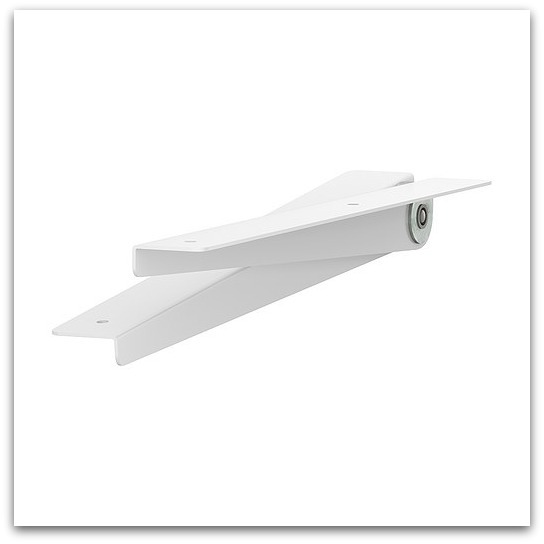 The Ikea EKBY RISET brackets are designed to work with sloping walls and can be adjusted and locked at different angles. Add an EKBY shelf and you end up with an optimal storage and display space in an otherwise wasted area of your home. Have you found another product that was a simple solution to a problem area? Do tell! I have been pondering for MONTHS how I can use the slanted walls in our cape cod home. The entire upstairs is open for my Quilt studio and now I can install some shelves for additional storage. Your brackets have made my day! FYI, love your site!!! I need these shelf brackets for my laundry room. However, I have tried to purchase them at Ikea and cannot find them. Would you happen to know if they have been discontinued? Check with customer service. I have a feeling they have been discontinued. I’ll let you know if I come across something similar. I am also looking for this solution. I, too, am looking for this bracket!!! Perfect, just what I need. Does anyone have a replacement?